The buildings of the Newcastle upon Tyne Trinity House posess a rich history and architectural heritage of their own, in part traceable back some six hundred years, as part of the Newcastle Quayside. Inside those buildings, the artefacts and fittings reflect the lives and collective endeavours of the Brethren as part of the unique, historical and enduring maritime tradition that is the Corporation of the Newcastle upon Tyne Trinity House. The buildings that together form Trinity House on Broad Chare, just off the Newcastle upon Tyne Quayside, lie on a site once known as Dalton Place, so named after John Dalton who originally owned it back in the early 1400’s. The land belonged to the large stone medieval town house, which lies on the north-west side of what is now the Trinity House courtyard. Like many medieval houses, it had its main room at first floor level and cellars in the space below. What might, at first glance, appear to be a butress at one end is in fact a garderobe – a medieval privy – and it is possible that the top part of the structure once collected water from the roof. In its time, this building has been a rigging loft, a hospital, almshouses and offices. The sundial bears the date 1721 but was relocated from the back of the Banqueting Hall in 1753, when the School House was extended and its original location was hidden from the sun. Because the face of the wall lies at a different angle, there is an inherent error in the sundial. The building is referred to today as the “Dog Bank building” in recognition of the pathway that leads up behind it, linking the Quayside, via Broad Chare, with the area around All Saints Church and the lower end of Pilgrim Street. From the courtyard, Trinity House is entered up a broad and graceful flight of steps, added in 1800, when the front of the building was redeveloped in classical style. This takes you into the Entrance Hall, an instantly captivating doorway into another world, with a strange collection of stuffed creatures, including cayman, por-beagle, iguana, sea turtle and mermaid, peering down on visitors from the ceiling. A particularly large turtle shell, on which the Coat of Arms of the Newcastle upon Tyne Trinity House was painted in 1755 is mounted on one of the walls. The Entrance Hall is also the domain of the Summoner, the official gate-keeper of the House, whose ancient title goes back to the times when the Master would send a servant out to “summon” the Brethren to the House. At the annual elections on Handsel Day, it is the Summoner who calls the eligible Brethren one at a time to place their votes, in recognition of his traditional duty. Directly across the Entrance Hall are the doors to the Trinity House Chapel, believed to be the oldest part of the House and the oldest private religious premises in continuous use within the City. The Chapel falls within the parish of St. Annes, a church which it predates by some 260 years! It is interesting to note that the Brethren also leased pews and maintained an altar and gallery within All Hallows Church, which stood on the hill above Trinity House until replaced in 1786 by the present All Saints Church. While the building of the chapel was amongst the objectives defined by the Brethren on 4th January 1505, its appearance has changed over the years. The pews are made of oak that has been verified as over a thousand years old and reputedly came from the Venerable Bede’s Monastery at Jarrow. They are decorated with cherubs, fifty-three of which were carved and fitted in 1634, to be followed by a further four two years later. The present interior panelling also dates from 1634 and is adorned with commemorative plaques, much in favour in Victorian and Edwardian times and dedicated to the memory of past Brethren. The roof was renewed in 1651 at a cost of £8 10/-, using timber from a wood at Walker and the style is frequently observed by visitors as imitating the underside of a wooden ship’s deck. The Chapel bell, added in 1685 and hidden away in a small tower, bears the inscription “If God is for us, then who can be against us?” – a biblical quotation taken from St. Paul’s Letter to the Romans, chapter 8. The majority of the stained glass in the Chapel windows was added by the seagoing members of the Henzell family between 1911 and 1930, although two later panels were added by Professor Leonard Evetts, late of Newcastle University. The organ (or strictly speaking harmonium) was made by Hunter & Co of Bristol in 1917 and is fully functional, adding a distinctive and appropriate tone to proceedings whenever required. The Chapel is used for services on Trinity Sunday, on Remembrance Day and by the Brethren for family occasions and their annual Carol Service. The Banqueting Hall is arguably the most popular room in the House. Originally known as the “Great Hall” or “Dining Hall”, it was constructed in 1721 and possibly replaced a previous refectory building. The ceiling is in four parts: an ochre-coloured surround runs from the edges towards a dominating oval centrepiece; a wide ring, decorated with a bold floral plasterwork pattern typical of the period is next; inside this is another ring, this time bearing a striking representation of a compass rose, with a Fleur-de-Lys indicating North; finally, in the centre there is a small, yet beautiful painting of a sailing ship, which is actually on a slightly concave surface, giving the clever illusion of the wind blowing and the sails filling from whichever point the observer is standing. Above the fireplace is a large block of black oak into which is carved the Stuart Coat of Arms; The Jacobean overmantle is equisitely fashioned and features sea-horses, serpents and other sea creatures. The carpet on the floor was specially made for the Newcastle upon Tyne Trinity House by the sadly now-defunct Durham Carpets in the early 1990’s and rests on top of a single piece of antique linoleum which extends the length and breadth of the room. By the end of the 20th century, this had suffered, particularly under the actions of the stiletto heels of lady visitors, causing the Brethren concern on safety grounds. However there was a good argument for conservation, even if repair was out of the question and, as a compromise, the carpet was laid over the top and one corner was neatly cut away and framed, retaining an exposed section for viewing. On top of this sits “King Charles’ Chair”, said to have been made specially for Charles I when he visited the House, the high seat supposedly to take account of his low stature and bringing his eye line up to that of those seated around a table with him. The room is dominated by two huge oil paintings. The “Bombardment of Algiers” depicts the action of 27th August 1816 when an Anglo-Dutch fleet under the command of Admiral Edward Pellew, Lord Exmouth, bombed the harbour of Algiers in a move that secured the release of the British Consul, together with more than a thousand Christian slaves and ended the practise by the Barbary pirates of enslaving Europeans. This painting was only the second major commission of the renowned Newcastle artist John Wilson Carmichael (1800-1860) and he secured 40 guineas from the Brethren for the task. Its vivid colours and voluminous style tip more than a wink to Carmichael’s fellow Tyneside artist and friend, John Martin. At the other end of the room, “The Heroic Exploits of Admiral Lord Collingwood in HMS “Excellent” at the Battle of Cape St. Vincent” depicts the coming together of the 74-gun “Excellent” with the 136-gun Spanish 4-decker “Santissima Trinidad” during the battle. This magnificant painting was a joint project between John Wilson Carmichael and another local artist, George Balmer (1805-1846). The two high recesses now contain made-to-measure tableaux but were once windows that looked out towards the Low Yard before the schoolhouse was extended in 1753. The tableaux depict two 18th century naval actions, the first being the defeat of a French squadron off Cape Lagos on 18th August 1759 by a squadron of HM ships under the command of the Right Honourable Edward Boscawen, Admiral of the Blue and the seconf the defeat of the French Admiral Conflans off Quiberon Bay on 20th November 1759 by a squadron of HM ships under the command of Sir Edward Hawke, also Admiral of the Blue. Also on show are two fine examples of another of the “lost arts” of the seaman. In the same way as they fashioned ships in bottles and carved scrimshaw in their off-duty hours, these are examples of embroidery, being coloured wool woven into marine canvas and depicting the ships “Ardmillan” and “Otterspool”. The window glass throughout the House is predominantly antuqie blown glass and many panes bear crude inscriptions – names, dates and interestingly professions. Opinion is divided as to whether these consitiute graffiti, advertising or simply a way of leaving a mark on history. The Board Room is one of the finest meeting rooms in the City of Newcastle. The 19th century oak board table and George III Mahogany chairs are dominated by the immense allegorical painting “The Four Continents” (17th century Flemish School, after Sir Peter Paul Reubens). Measuring 109 1/2 x 86 1/2 inches (2.78 x 2.20 metres), the representative figures ensure a stern mood is maintained on the Board’s deliberations. In Victorian times, when such things were deemed controversial, the naked female flesh was overpainted with a veil; in 1958, a local art expert, Dennis H. Bynon, restored the painting to its former “liberated” glory. On the opposite wall, a Ludolf Backhuyzen painting of a Dutch warship “The Eendracht” is seen, flanked by portraits of two of the Royal Patrons of the House. At the end of the room stands a large glass case containing one of the finest examples of the “bone models”, made by French prisoners of war during the Napoleonic wars. Made from beef and mutton bones, with each meticulously carved plank pinned onto a perfect ship’s frame, these models were made, often to order, and sold to garrison officers to raise the money to secure the prisoners’ freedom and repatriation. In the 1950’s this model was lent to an exhibition in London and returned with the whole front end smashed. Mr Donald Ash, of Whitley Bay, spent over 600 hours repairing it for the Brethren and used sections of spare mast and spars to fashion the replacement bow-sprit. Alongside this model is a much, much smaller model ship, contained in a straw case. While the detail of the larger model is impressive, the intricacy of this tiny ship is positively inspiring and thought to be the work of Swiss clock-makers, impressed into the French navy and later taken prisoner by the British. Two globes survive from the Trinity House school: one is an Adams Terrestrial globe, published in 1857 and the other is a Newton’s celestial globe, also from 1857. Both are in walnut frames, mounted on mahogany tables. The Master’s Room is understandably the warmest and most intimate room in the House. It is used as an informal gathering place for the Brethren and for entertaining private guests. It also serves as the vestry when the Chapel is in use. The room bears testimony to the many naval wardrooms whose members have visited the House, leaving mounted crests of their ships as gifts and which form a colourful and interesting display around the room. The tall George I Walnut 8-day Longcase clock was made for the House by William Kipling of London in 1725 and the House Coat of Arms is engraved into the armorial in the arch. The centre light has been created from the wheel of the Royal National Life Boat “Tynesider”. To one side is a low desk, known as “Nelson’s table”. The original piece of mahogany was collected by the Admiral in the West Indies and fashioned into furniture by his ship’s carpenter, to be given to his prize-agent (accountant), Mr. Alexander Davidson of Swarland Hall, Felton, in Northumberland. After changing hands several times, the table was presented to the House by the widow of Captain George Matthews of Amble, in his memory. The library contains many accounts of the early voyages of exploration and works of local history. It is currently the subject of a long-term conservation project, which will ultimately result in controlled access to this rich source of material by research students. The library also houses one of the most appealing and popular features in the House, a false panel concealing a secret door, which leads through into the Chapel. 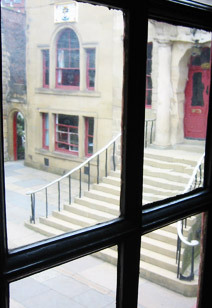 The Newcastle upon Tyne Trinity House property extends further towards the river and is accessed via a low archway off the courtyard, passing between the back of the Banqueting Hall and the School House, down into Trinity Chare and towards the Quayside. To the left is the Low Yard, a light, open courtyard onto which the School House and two sets of Alms Houses face. Those on the north east side of the yard were last used as accommodation in 1964 and are now offices and dressing rooms for the Live Theatre. The view from the centre of the Low Yard up the hill towards All Saints Church is one that must have been essentially similar for several centuries, in contrast to that which presents itself from across the river, framed neatly between the buildings, revealing the Sage Music Centre over in Gateshead – a reflection indeed of the quiet, unpretentous work of this ancient organisation that endures amidst the bustle of the Newcastle Quayside.